Our Cobra specialist featured on the Impel Trading Card #38 is a huge fan of big bangs. I present to you, Firefly, Cobra saboteur. No one knows Firefly’s true identity, his name or what he looks like. He started working with Cobra since the very beginning of the organization. 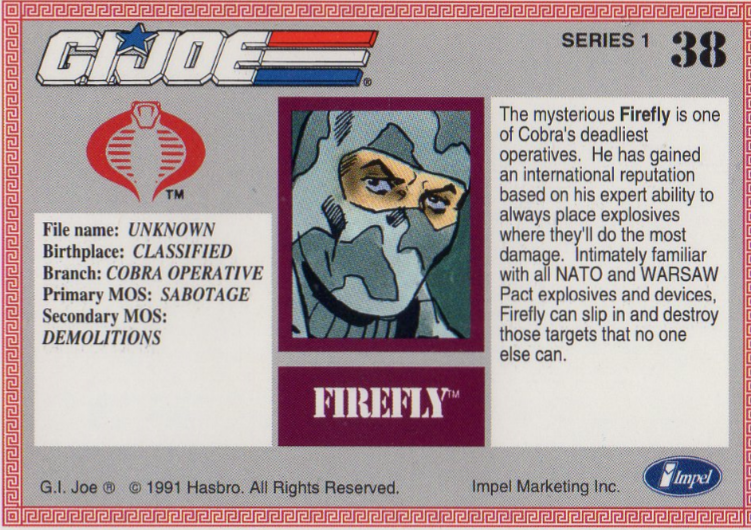 Firefly was first contacted by Cobra Commander to assassinate Snake-Eyes, who CC blamed for the death of his brother. Firefly soon realized he was no match for Snake-Eyes. Zartan was brought into the fold to deal with it, but because the Hard Master was impersonating Snake-Eyes, the arrow that was meant for him struck the Hard Master instead. 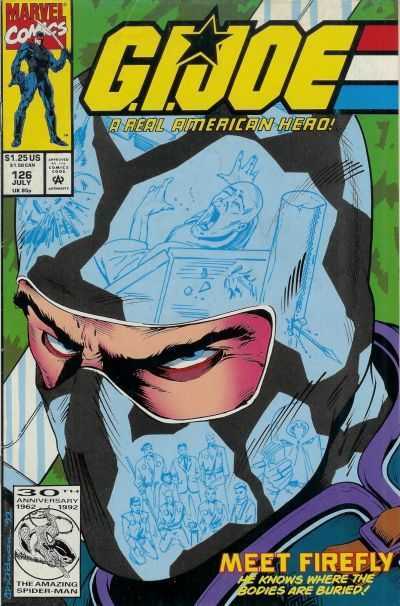 Storm Shadow was blamed and thus began the whole Arashikage story arc from ARAH. Firefly was again involved with the death of another Arashikage Master, the Soft Master. Firefly and Scrap-Iron chased the Soft Master when he arrived in Springfield trying to find the killer of his brother. 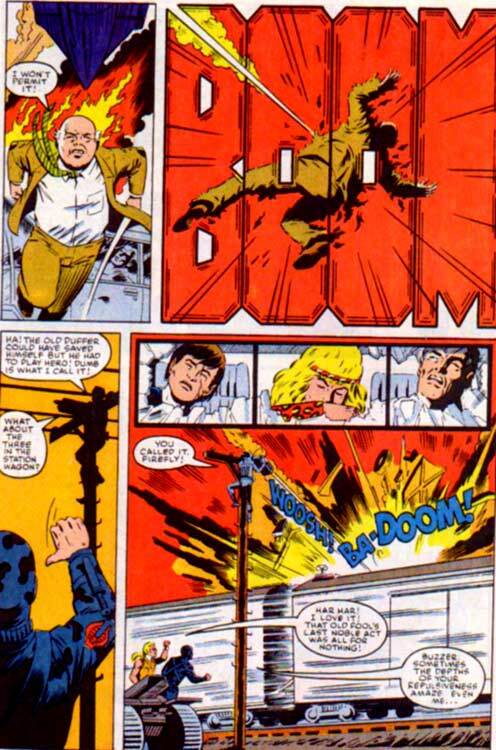 They launched two missiles at the Soft Master, killing him, Candy, some random (drunk) dude and wounding Billy (CC’s son). After the real CC returned, he locked most of his insubordinate crew into a landlocked freighter which got buried under the volcano. Firefly escaped by letting B.A.T.’s dig a tunnel. 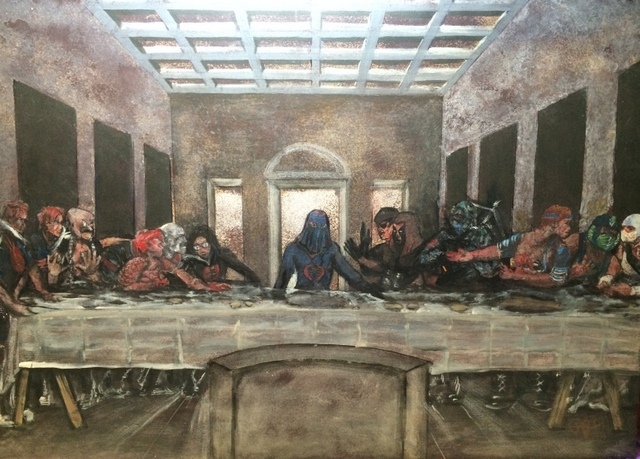 He brainwashed the Red Ninjas – which used to be Arashikage members. Snake-Eyes eventually liberated them and they chased after Firefly looking for vengeance. Firefly was assumed to be death. Firefly does reappear in the Devil’s Due continuity and both the America’s Elite and Reloaded series. 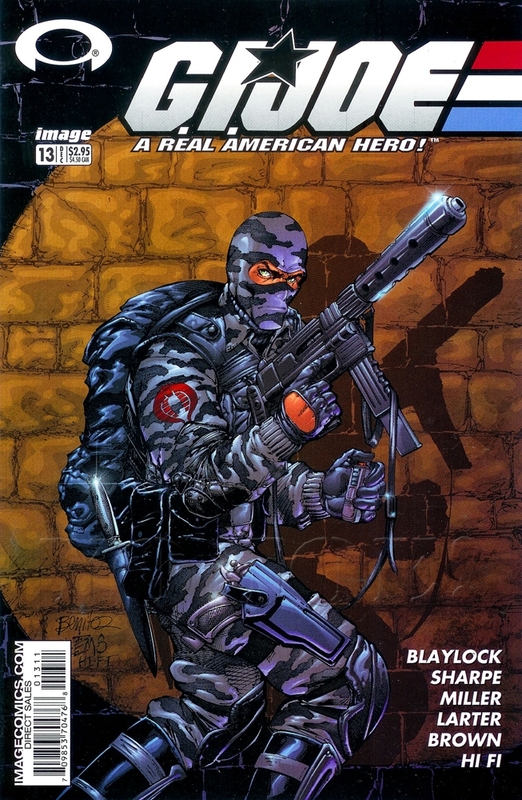 My first memories of the character are from the Special Missions comic #1 in which he aids the Baroness in finding the supposed sunken sub in the Baltic Sea. I had this comic book as a kid, the Dutch translation in TPB, and it was my only Joe comic book back then. Needless to say, I read it a gazillion times. In the live action movie Retaliation, Ray Stevenson portrays Firefly. Stevenson revealed in an interview that Firefly is an ex-Joe. 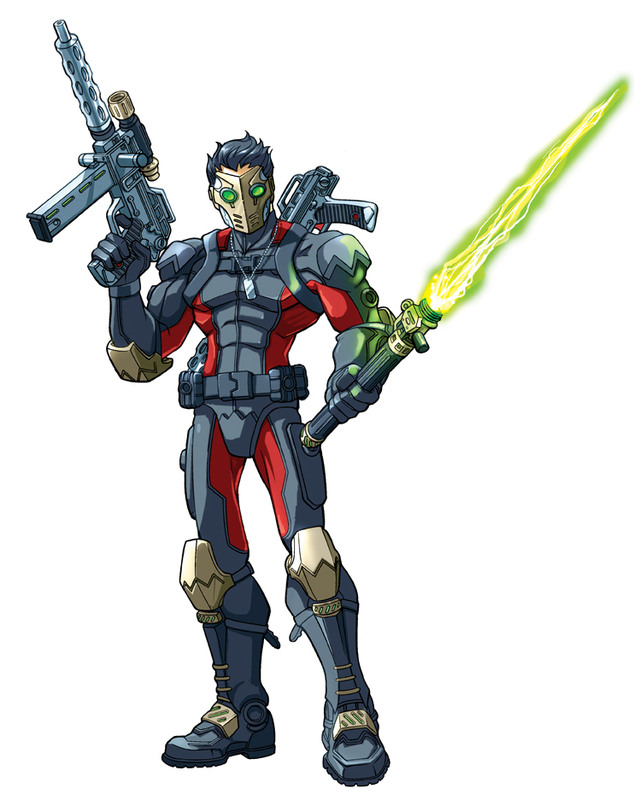 His codename in this version stems from his trademark weapon system, insectoid robot drones which he uses to surreptitiously deliver explosive charges. 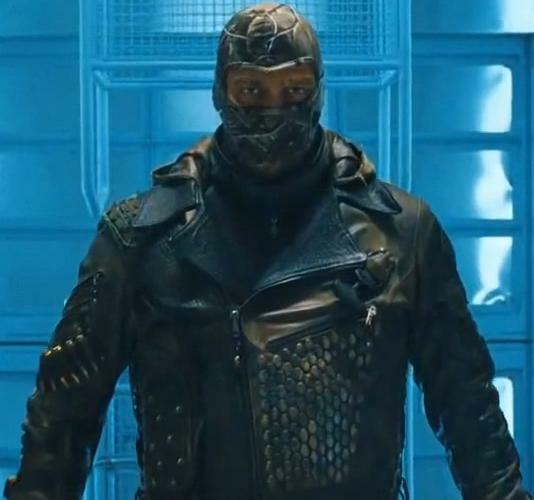 The character was not supposed to wear his mask, but the actor, who researched the character and became a fan of the original Firefly, lobbied to be shown wearing it in some scenes. While trying to activate a satellite for Cobra Commander he is attacked by Roadblock who causes the drones to explode on Firefly. There have been 28 renditions of the Firefly character made into action figures. Starting in 1984 with the original gray camouflaged version. 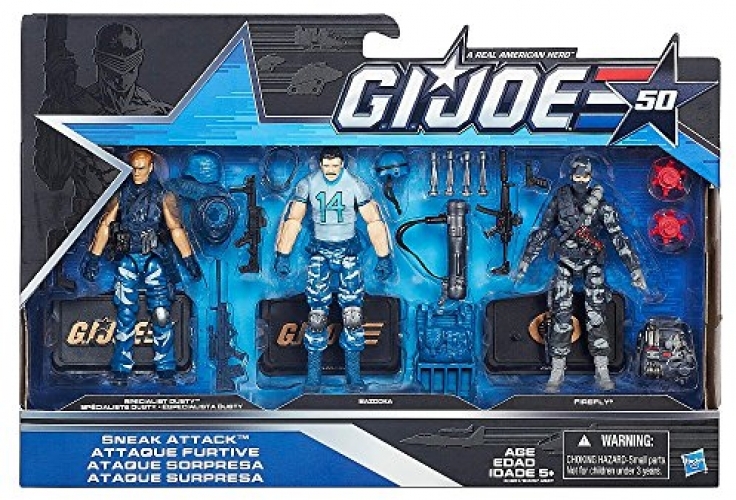 Later versions changed his colors to green, light gray, red, purple, blue, black only to return back to the dark gray for the 50th-anniversary edition in 2015, the figure being released with Bazooka and Dusty. Author European JoePosted on July 9, 2017 Categories G.I. 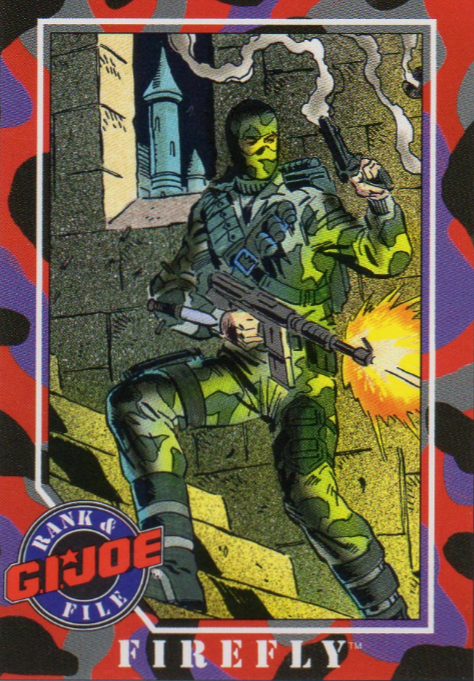 Joe, TCGTags #38, firefly, gijoe, impel trading cardsLeave a comment on Let there be light!